In this Emerald Star Flagship and Scout Squadrons Illustration, Admiral Starland is commanding the Galactic Alliance flagship on its approach to assume an orbit around planet Earth. This took place 100,000 years ago before the last cyclic polar shift took place. The two squadrons of Scout Interceptor support groups, both in triangular formation, are headed to the surface of the planet to carry out separate missions in an attempt to locate where the tyrant Sen Dar is hiding out to avoid capture. 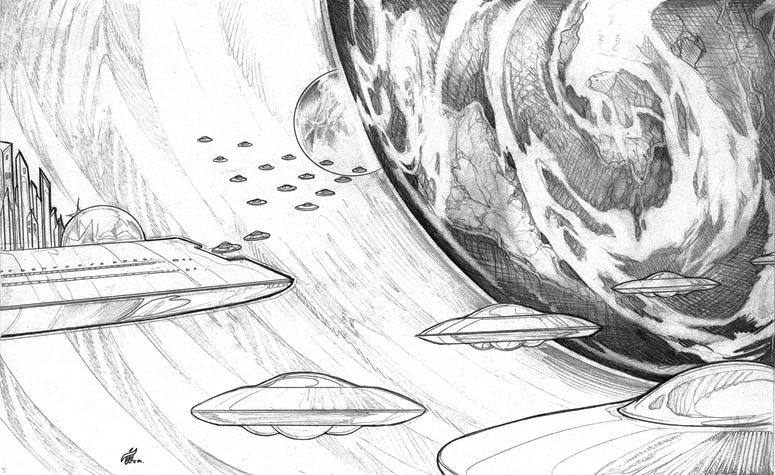 Scene – In this Emerald Star Flagship & Scout Squadrons Illustration, two triangular formations are on approach to planet Earth. The extraterrestrial tyrant they are hunting for, has stolen one of the mystic crystals of The Ancient One after he first killed his former spiritual mentor named Master Nim to get it. He also stole from his dead teacher half of The Ancient One’s sacred map that discloses where the other map-half is located, along with the Adepts who guard the other two very special crystal devices. 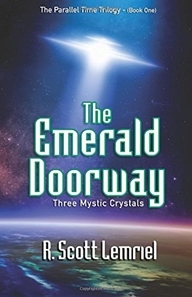 The Emerald Star Flagship and Scout Squadrons Illustration depicted above is actually the opening doorway that eventually leads to present day Earth and the ultimate destruction or uplifting transforming survival of the entire planet. Sen Dar has only one purpose now, and that is to collect all three crystal devices in order to put them together so that he can use them to travel to the very heart of the mystic realm of The Ancient One or Prime Creator. Once there, he believes that he will take the place of Prime Creator and become the absolute ruling God of eternity over the entire multi-dimensional creation and all life within it.